So I’m in college and starting to realize that while performing is lots of fun and I’m doing well for a college student, my financial well-being is completely tied to my ability to book and work gigs. But what if the economy goes south? “Extras” like live entertainment are one of the first things to go. Or what if I get sick or can’t work for some reason? Now I’m not making any money and probably spending more on whatever treatment I need to recover. Maybe this “get a job” thing isn’t so bad after all? It sounds easy. Regular paycheck. Regular hours. Work I’ll probably enjoy. My dad always said that if I had an engineering degree, there would always be jobs (not entirely true as we found out in the recent recession). At this point, I was planning to go to grad school. My interest in all-things-tech, specifically software-driven automation, had become more interesting than magic. So I made the first of many total 180s in my career path. I stopped performing and got a “job” as a research assistant. Yeah, I know, it’s not a real job, but it was a start. Besides, I had heard the stories from other friends about their “corporate internships.” I wasn’t (yet) willing to go that far. Lame. Wrote code to solve the sine-Gordon Equation and visualize the results in 3D space. That work landed me a coveted Goldwater Scholarship. Wrote code to analyze ECoG brainwave patters to help detect epileptic seizures prior to the onset of physical symptoms. 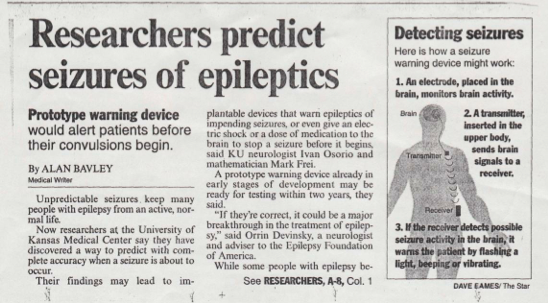 I believe this work went on to be used to detect and stop seizures. Wrote code to analyze and visualize models for the evolution of the large-scale structure of the universe. Somehow I ended up as first author on a paper in The Astrophysical Journal… without having to write a word of the paper! (at least I did all the work).